Former Federal Reserve Chairman Alan Greenspan said Sunday that apart from the housing and commercial real estate markets, the economy is "showing some buoyancy," and he expects the pace of job creation to pick up. Greenspan said a number of factors are contributing to economic and employment momentum, including consumer spending and corporate capital investment. 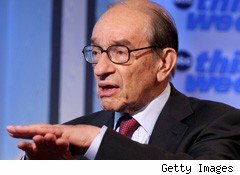 "The capital gains on 401(k)s is $600 billion," Greenspan said on ABC's This Week. "When we saw money evaporating in those particular accounts, people pulled back their consumption. They're now moving forward in a more positive direction." The former Fed chief added that although capital investment is still depressed for real estate, corporate spending on new equipment is "coming back in a fairly substantial way." Most important, Greenspan said, is a massive and under-appreciated snap-back in inventory replenishment from in-the-basement levels. "[Purchasing managers] are going to have to build inventories to protect their product lines at an ever increasing pace, and that is a self-reinforcing cycle," Greenspan said. Gross domestic product rose at a robust 5.7% pace in the final quarter of 2009 thanks largely to a build-up in inventories. Greenspan added that the threat of a double-dip recession has "fallen significantly in the last two months." The former Fed chairman's remarks came after last week's Labor Department report, which showed that March was a fairly good month for employment growth after all, as the economy added 162,000 nonfarm payroll jobs. That was a substantial improvement over February, when the nation lost 14,000 jobs. Although it wasn't the first month since the recession began that the nation has added jobs -- small gains were made in November 2009 and January 2010 -- it was the biggest U.S. employment rise since March 2007, when the economy added 239,000 jobs. The unemployment rate remained unchanged at 9.7%.